Government officials believe this decision has only increased the pressure on the US dollar and reduced the value of the Haitian gourde even more. "We realized that the decree, instead of providing solutions, leads to expectations that have an impact on the cost of living," said Guichard Doré, special adviser to Haitian President Jovenel Moise. When the decision was made you needed 64 gourdes for one US dollar. As of October 5, 2018, you need a whopping 72 gourdes for one US dollar. 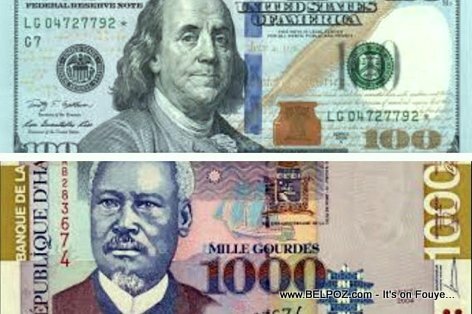 Keep in mind, our Dominican neighbors adjust the value of their pesos to the Haitian gourdes according to rise and fall of the US dollar in Haiti. As the US dollar goes up, so does the value of the peso Haitians have to buy in the currency market. Dore said that the government was going to take another decree "lighten" the decree of 1 March 2018. Prices across the country would always be fixed in Haitian gourdes on the market "but it will be possible to pay in US dollars. The decree prohibited all transactions in US dollars, but now we won't force people to pay in US dollars, but if you pay in US dollars, it will be no problem, " he said. Ayayay! I am writing this and I am laughing! One strategy the Haitian government can use to help the circulation of national currency is to place a higher tax bracket on foreign currency markets (transactions). In doing so, people will be forced to buy with national currency which will result in devaluating of foreign currencies. Charge an additional fees to all transactions made with foreign currencies. One strategy the Haitian government can possibly use to help the circulation of national currency is to place a higher tax bracket on foreign currency markets. In doing so people will be forced to buy in national currency which will result in bringing down the value of foreign currency. Charge an additional fee to all transactions made with foreign currency.